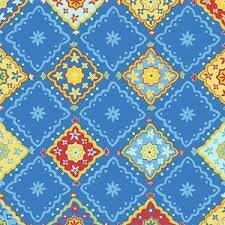 Designed by Cathy Heck for Henry Glass & Co., this cotton print panel features blue multi colored bean bags. The fun fabric measures 44-45" wide, and is used for quilting and craft projects and décor accents. Colors include red, blue, green, gold, brown and white.